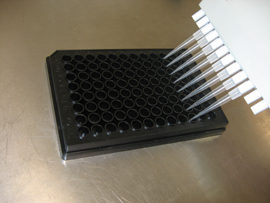 Tyrosine Assay Kit | Cell Biolabs, Inc.
Tyrosine is an amino acid that plays various roles in the body. It is involved in signal transduction via receptor tyrosine kinases. Tyrosine is also a neurotransmitter precursor and increases the levels of plasma neurotransmitters such as norepinephrine and dopamine. Our Tyrosine Assay Kit is a quantitative colorimetric assay that measures the total amount of free tyrosine present in foods or biological samples in a 96-well plate format. Tyrosine levels in an unknown sample are calculated based on a tyrosine standard curve.